Moreover, the Hadith, or Sayings of the Prophet, present us with an ambiguous picture at best: At turns we read of artists dared to breathe life into their figures and, at others, of pillows ornamented with figural imagery. If we turn to Islamic law, there does not exist a single legal decree, or fatwa, in the historical corpus that explicitly and decisively prohibits figural imagery, including images of the Prophet. While more recent online fatwas can surely be found, the decree that comes closest to articulating this type of ban was published online in 2001 by the Taliban, as they set out to destroy the Buddhas of Bamiyan. In their fatwa, the Taliban decreed that all non-Islamic statues and shrines in Afghanistan be destroyed. However, this very modern decree remains entirely silent on the issue of figural images and sculptures within Islam, which, conversely, had been praised as beneficial and educational by Muhammad ‘Abduh, a prominent jurist in 19th century Egypt. In sum, a search for a ban on images of Muhammad in pre-modern Islamic textual sources will yield no clear and firm results whatsoever. While Islam has been described as a faith that is largely aniconic—i.e., that tends to avoid images—figural imagery has nevertheless been a staple of Islamic artistic expression, especially in secular, private contexts (and today, Muslim majority countries are saturated with images, dolls, and other representational arts). Indeed, a variety of Muslim patrons commissioned illustrated manuscripts replete with figural and animal imagery from the 13th century onward. As a result, this visual evidence clearly undermines the premise that images of Muhammad are banned in Islamic law and practice, thereby providing us with a less ideologically divisive and more fact-based way to speak about a subject that has grown increasingly contentious ever since 2005. Representations of the Prophet in Islamic traditions have varied over time, and they have catered to different needs and desires. 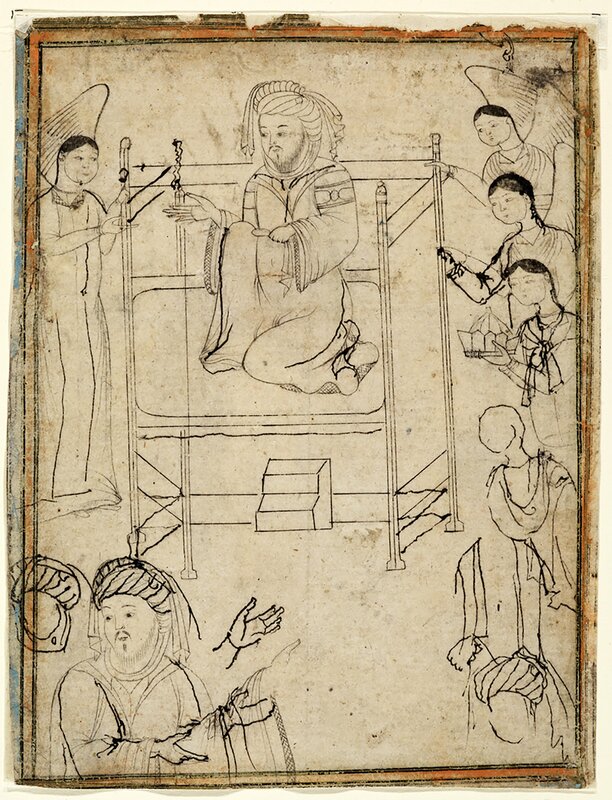 During the fourteenth century, a number of Persian drawings and paintings depict Muhammad as an enthroned leader surmounted by angels and surrounded by his companions (figures 1-2). These images show the Prophet as a human messenger entrusted with divine revelation through the angelic figures that protect and accompany him. 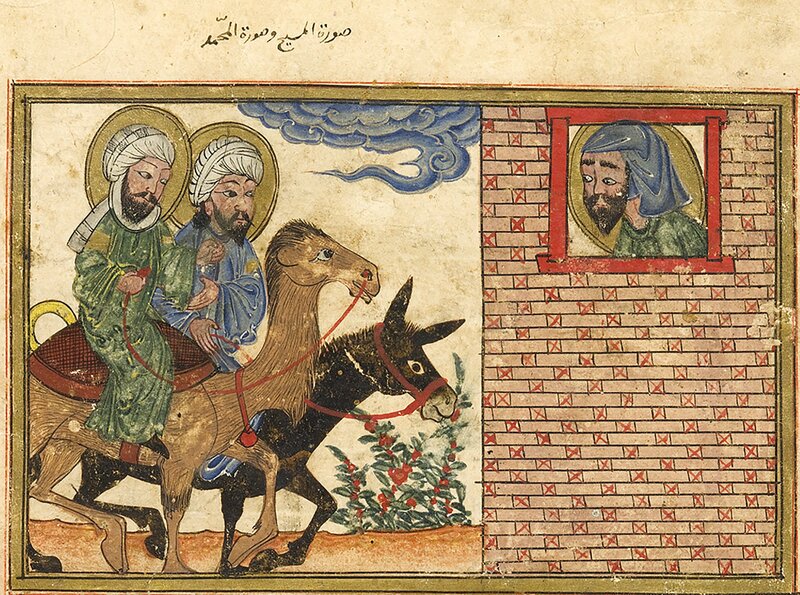 At other times, medieval paintings depict Muhammad alongside other Abrahamic prophets, the latter frequently represented in 16th century illustrated copies of popular texts concerned with explaining the lives and tales of the prophets (qisas al-anbiya). In some instances, Muhammad is accompanied by Jesus Christ—revered as the Prophet ‘Isa in Islamic traditions—both of whom are said to have been seen in an apocalyptic vision by Isaiah (figure 3). 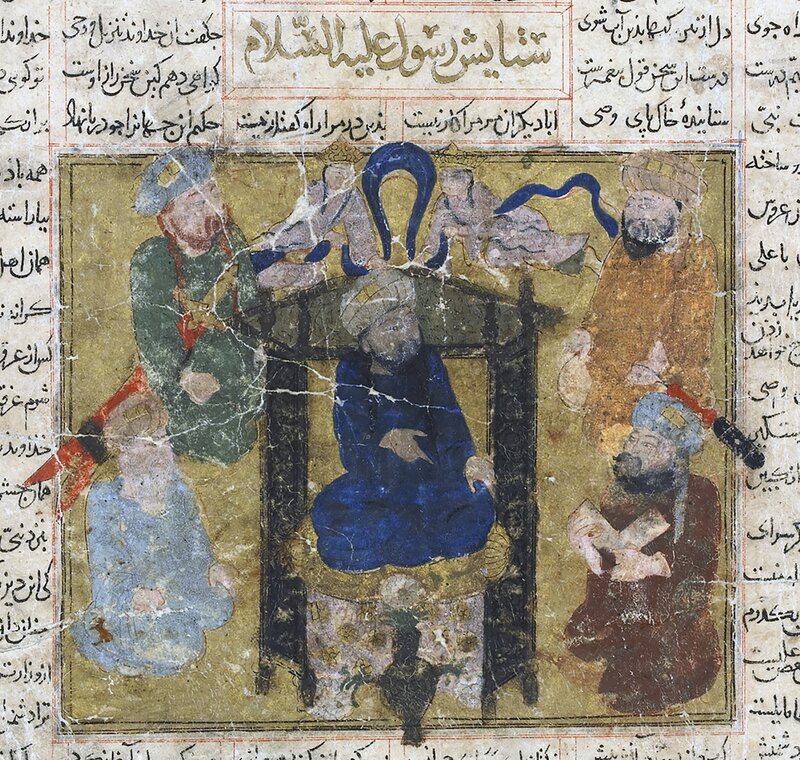 In other tales, especially those dedicated to narrating and illustrating the Prophet’s heavenly ascension (mi‘raj) from Mecca to Jerusalem and onward through the celestial spheres, Muhammad is depicted surrounded by the Abrahamic prophets as he sits in the Dome of the Rock in Jerusalem (figure 4). 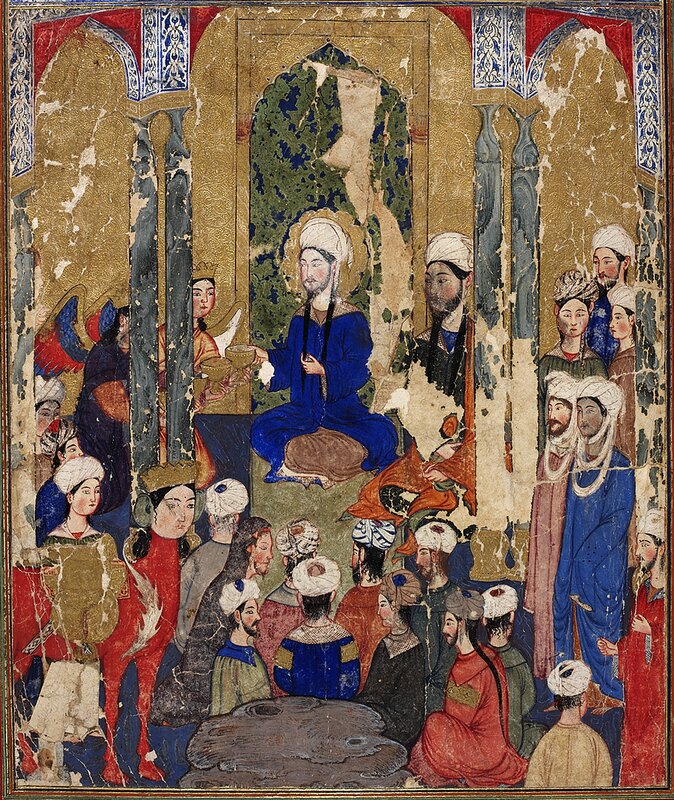 In these medieval paintings, some of which were commissioned by a Sunni ruler in Iran, Muhammad is praised as the leader of his faith community, as the bearer of divine revelation, and as a messenger belonging to a long and respected line of monotheistic prophets. 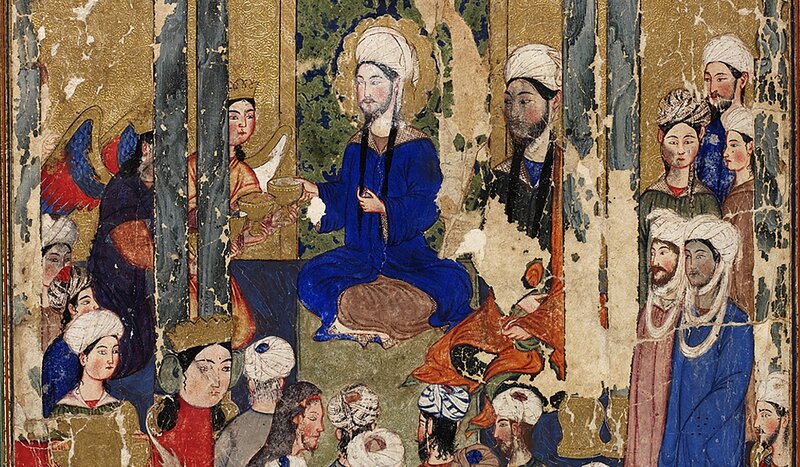 After 1500, a major shift in representations of the Prophet occurs in both Persian-Shiite and Ottoman-Sunni lands. 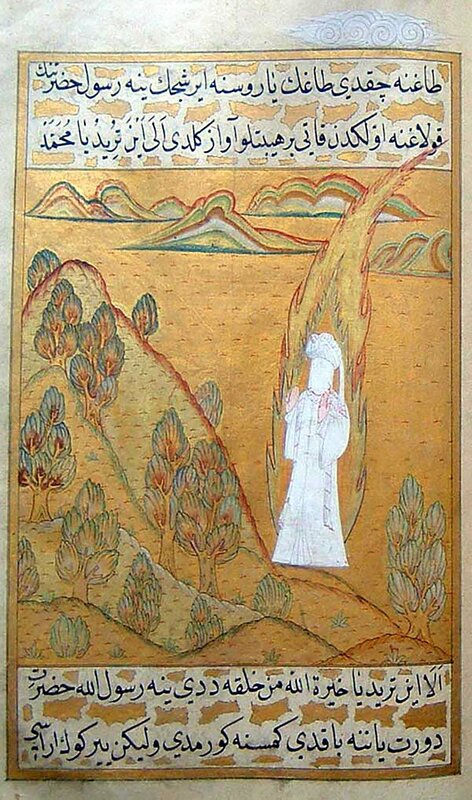 Muhammad’s facial features become covered by a white facial veil while his body is engulfed by a large gold aureole, visual devices that doubly stress his unseen, numinous qualities (figure 5). While these more abstract depictions of the Prophet certainly show an emerging tendency to shy away from figural representation, they also praise the Prophet according to a metaphorical language that is a hallmark of Sufi (mystical) traditions found in both Sunni and Shiite spheres. 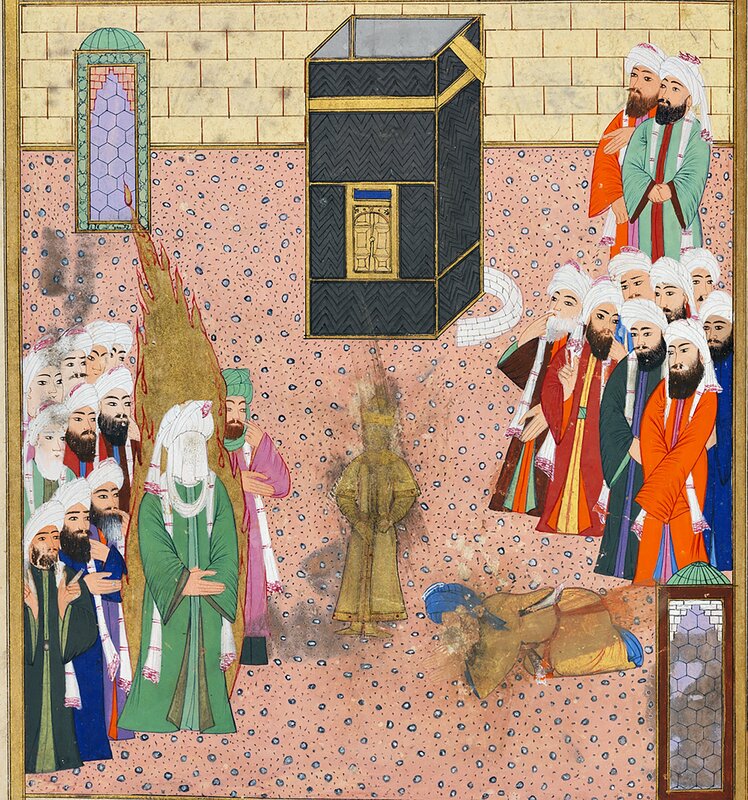 Particularly interesting is a series of late 16th-century Sunni-Ottoman paintings of the Prophet’s biography (sira), in which Muhammad is shown confronting the very issue of idolatry as he approaches the Ka‘ba in Mecca (figure 6). In this and other cases, the image of Muhammad is preserved in a pristine state, while the gold idol and its prostrating idolater have been rubbed away by the painting’s viewers. Here then, the problem is not so much the depiction of the Prophet, but rather paganism and polytheism, which are here visually excised in order to make symbolic way for a strictly monotheistic world order. While images of the Prophet have waned since 1800, there nevertheless exist a number of modern and contemporary representations that reveal a rather unsteady, and thus not cohesive or uniform, approach to the production of Muhammad-centered imagery. While “blessed icons” of the Prophet made in Iran during the 19th and 20th centuries show Muhammad in his full corporeal form and touched by God through the symbol of the golden halo, depictions in Sunni and especially Arab lands remain largely abstract and show a clear preference for textual representations describing his physical attributes. Known as hilyas, these aniconic icons most recently have been printed in Turkey in the format of a state ID card. As portable icons, these cards give details about Muhammad’s birth date and place as well as the date of his endowment with prophecy. Moreover, they depict the Prophet through three metaphors: the rose (known as the “rose of Muhammad”), his seal impression (reading “Muhammad is the Messenger of God”), and calligraphic renderings of his name in Arabic script. The contemporary ID card of the Prophet highlights a number of issues that are of particular concern today. First, just last week these laminated hilyas were used as invitation cards for celebrations of the Prophet’s birthday in Turkey. At exactly the same time, ISIS suppressed all Mawlid celebrations in Iraq, and recently a document has revealed that Saudi Arabia has discussed plans to exhume the Prophet’s remains from his tomb in Medina, supposedly in order to prevent his worship. Taken altogether, these images, sites and celebrations have one thing in common: namely, a very contemporary urge to erase various forms of devotion to the Prophet within discourses emanating from extremist and Salafi spheres. Such discourses, which present themselves as representing a “true Islam,” have been loudly present in the public sphere. Couched as normative and thus representing a general consensus, they have the net effect of turning images of the Prophet into items that should not, in principle, exist. Theory and practice, along with fact and belief, find themselves at odds here, to say the least. When one speaks of a “ban” of images of the Prophet in Islam, the negative repercussions are many. First, all doors to constructive dialogue on the topic are closed a priori, thus precluding a nuanced and apolitical discussion of historical Islamic images freed from the polarizing narratives of today. In addition, such images effectively become further endangered as a form of artistic heritage if merely speaking of and illustrating them is seen as a subversive, rather than a productive and reconstructive, act. And so we must pose ourselves yet another question: why not celebrate this global artistic patrimony by flooding our eyes with beautiful images instead of unseemly cartoons? In so doing, such images will invite us to ponder, at least to a small degree, all that connects us as visual human beings, regardless of creed and conviction.